A wonderful dose of pure silliness. Thank you, Derrick! I’ve been facetious since I was a boy, but it sounds as if, at long last, I’m beginning to build on it. Perhaps the silliness comes from approaching old age, or it might be a side effect of the tablets! Great picture. Better then or now? or failing that, google some images of it. I often think like you that it would be good to be granted a couple of hours in the past but I would worry what diseases I might bring back with me! 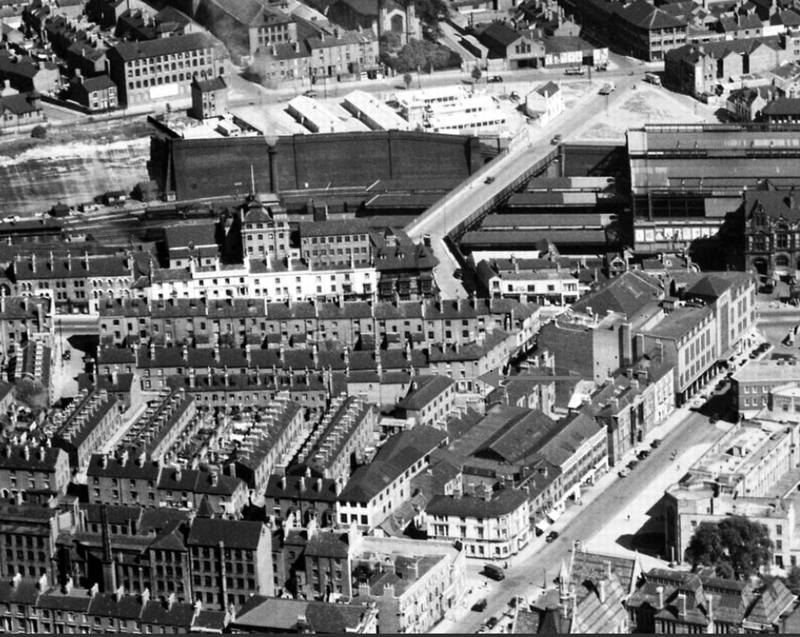 Given the reputation of the Black Boy hotel with the RAF and the Eighth Air Force, something below the waist and really nasty is virtually guaranteed. I’m curious to know what the card says. Well, at least one person has had a very gallant go at translating it (below, the comment by John Hodgson). It may be my age or my glasses, but I can’t even read the majority of it. The other side of the postcard, in Part 6, was translated by Pierre Lagacé but I think the handwriting and the faded ink defeated even him in the end. He wrote: “In the first part, he writes that indeed he finds it better to send postcards. It’s better than letters that are rare and costly. It describes much more (what he could be writing in a letter about a place). 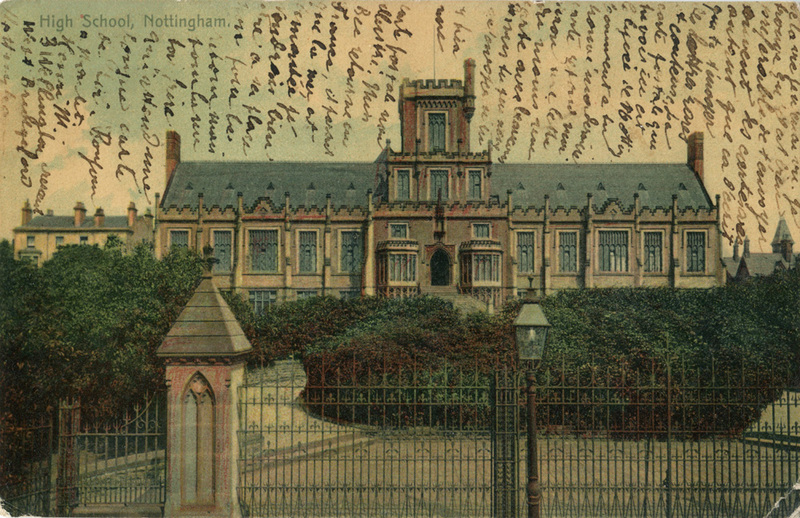 The postcard is the Lycée of Nothingham which one of your readers wrote about. Definitely French. The address at the bottom, 3 Willoughby Crescent West Bridgford, is that of the sender, Henri M. It looks as though the text continues from the other side. The first section is saying that it is better to send the recipient open missives on a post card rather than rare, and costly, (sealed) letters. 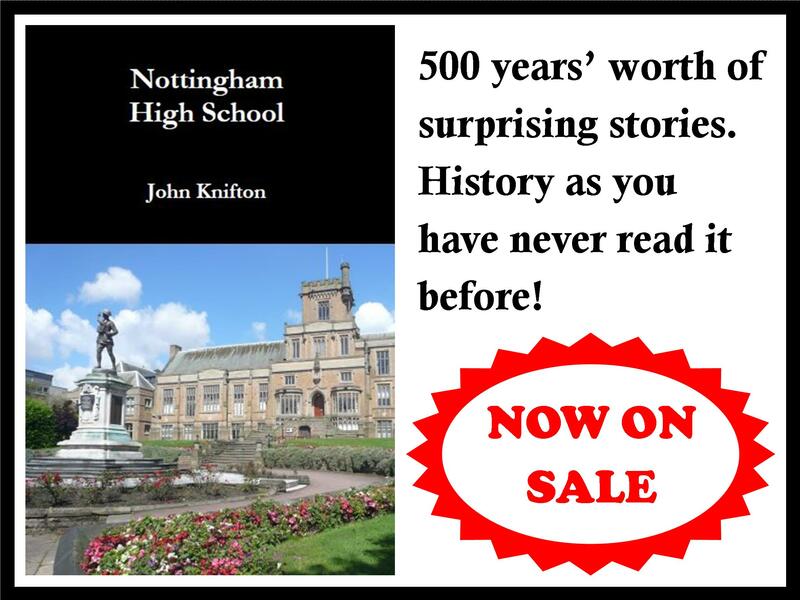 Then it identifies the scene as the ‘lycee de Nottingham’. After that it has defeated my 70 yo eyes”. Thank you very much for taking the time to give me what you have, John. Words written and spoken from the past. Absolutely! I’ve never quite got over the feeling of having a human being, now long gone, speaking to me from the past, from his long vanished world. That’s what treasures from the past do for me, John!! The first part is an apology that the recipient had to pay a surcharge for a previous card because the writer had put the stamp on the picture side ‘which is officially prohibited (formellement defendu). He then says he has written cards to ‘Millet’ and ‘Moulet’ (which I think are pet or nicknames) and suggests Mallieu asks to see the one addressed to Moulet. Then he says you can’t complain I don’t write often, you will be getting an avalanche of cards. I will write a letter or a card every day.I am writing a letter to nana. I got a letter from mother today and I threw it on the fire for the envelope. I could however still read it in white on the black paper. (Strange but true and a faithful literal translation). The wind is blowing like never before. Thank you very much for that. Just above is the comment from Pierre Lagacé with his translation of the other side, but he too found the fading and the handwriting very difficult to deal with. Anyway, thank you for your efforts, you have done very well with Nottingham’s answer to Enigma. Indeed they will. Upstairs at the Clinton Arms Hotel was the room where the members of the local Shinney Club, in 1865, held a meeting, convened by JS Scrimshaw, when it was proposed that “Forest Foot Ball Club” be formed. On the fledgling club’s founding committee were Old Nottinghamians, Thomas George Howitt and WH Revis, the scorer of the first ever Forest goal. Monty Python is just classic comedy isn’t it? It certainly is, and has filled a significant part of my brain I am sad to say. When all of Monty Python comes true. I believe that the world will end. And a lot of it has, especially the reality motorway police shops which must be uncannily like the films of the Leicester by-pass mentioned in the hotel where Mr Bimmler was staying. My favourite is “the bally Jerry who pranged his kite right in the how’s-your-father ” and ended up by catching his cam in the bertie. Happy days ! The YMCA, at the corner of Mansfield Road and Shakepeare Street, was the work of the architect T.C.Howitt (ON). Amongst other buildings he was responsible for Nottingham’s iconic Council House, The Newton Building and The Portland Building at Nottingham University. He was in the High School from September 17th 1901 to April 1904. His father was James Cullin Howitt who lived at “Brooklyn” in Hucknall Torkard. He was the Secretary of the Hucknall Torkard Cooperative Society. But weren’t you the person who asked for “Brincliffe” ? No, I remember the last couple of years of Brincliffe being open. It was a bit of an oddity really: single-form-entry and open only to county pupils (like its counterpart Henry Mellish) despite being within the city limits. Howitt’s greatest achievement (IMHO) was his work for the City Corporation laying out the new council estates to the west of Nottingham in the 1920s. The generosity of the plots makes modern “executive” developments look pretty miserable. I can remember Brincliffe being there in the first few years that I was at the High School. 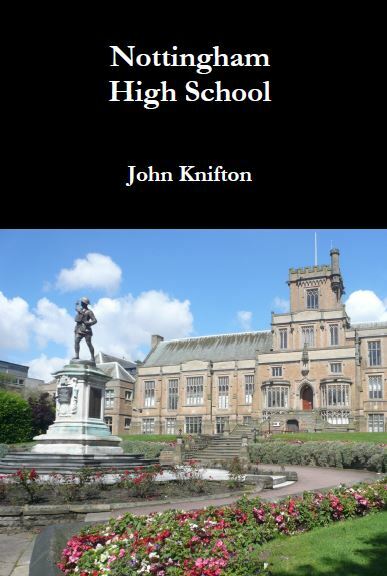 I may even have taught the odd few Sixth Form lessons in there. It would have been at some point in the 1980s that it was demolished to make the staff car park. It was freezing in the winter! A spot by a working radiator was much prized. When they converted the place into what passed for a VIth Form Centre in those days they blew the budget on two secondhand, quarter-size snooker tables and a table football game. We could never have envisaged the sheer opulence of the modern facilities.